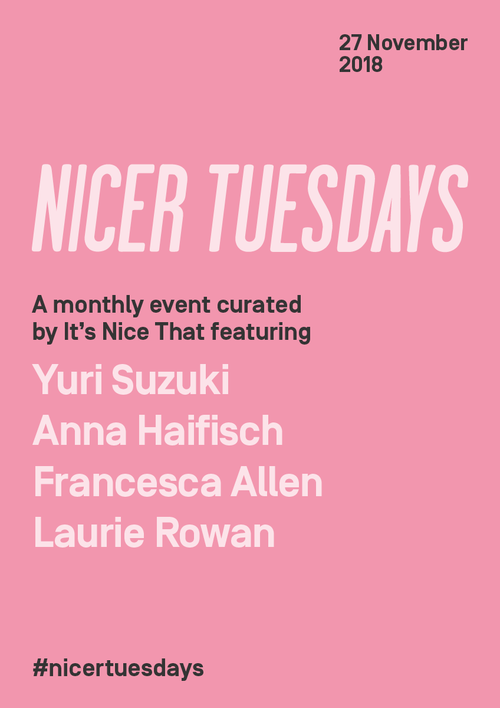 Tickets are now available for our November event this month, featuring talented animator Laurie Rowan, renowned interactive designer Yuri Suzuki, the hilarious illustrator Anna Haifisch and beloved, eye-opening photographer, Francesca Allen who will take to the stage at Oval Space. Timings for the evening: doors open at 6.30pm and the talks will begin at 7.15pm. Oval Space will be serving delicious food throughout the evening with the venue open until 10pm and we'll have drinks kindly provided by The Five Points Brewery. A massive thanks to our event partners Dropbox and Adobe Stock, and our supporter The Conran Shop. Nicer Tuesdays is an 18+ event; please bring ID with you to the venue.